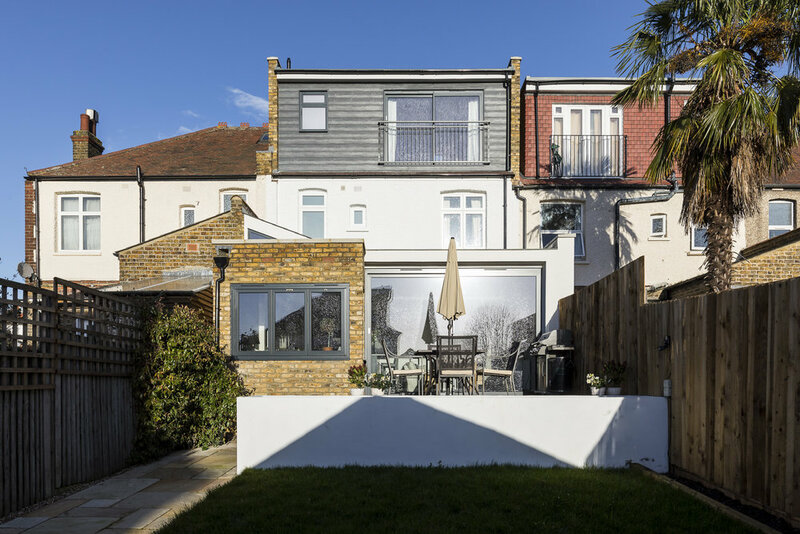 Phil and Sam’s project involved the construction of a single storey infill extension, loft conversion with rear dormer and a whole house refurbishment. The property is a large, traditional, London terraced property ideally suited for both an extension and a loft conversion. The design incorporated two elements. The first was the importance to maintain the original appearance and character to the front of the house; this was achieved by the addition of period tiles and refurbishment to the front garden. The second element created a rear extension that was designed with a modern feel with flat roofs, large grand sliding doors and slit roof lights. One of the major design features devised by Model Projects is the creation of a bay window area. This was designed to protrude outwards from the rear annex. It included London Stock bricks, a corner window and rooflight. A triangle shaped window was added between the flat roof of the bay window area and the original pitched roof. This added a wow factor to the open-plan space and helped increase natural light into the kitchen area. The loft conversion consisted of a full width dormer. This was clad using composite timber and a large set of sliding doors. The doors allow for fantastic views of London. 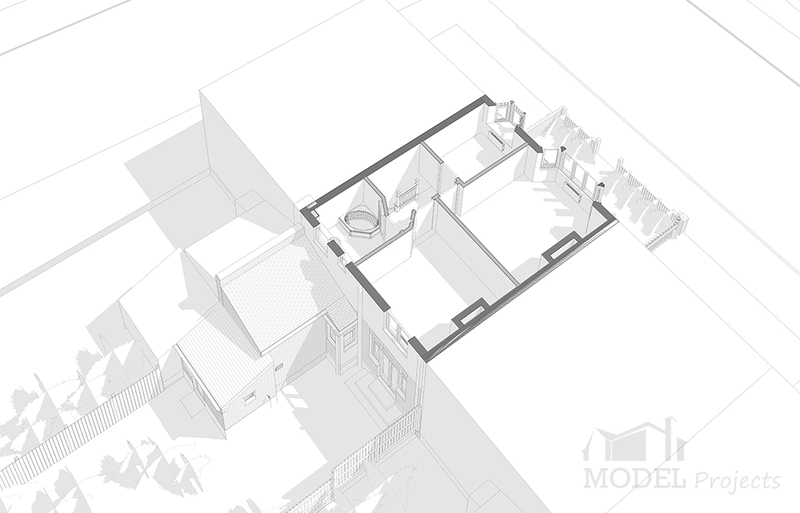 One of the central parts of the design is the kitchen that opens out to the dining and family space. 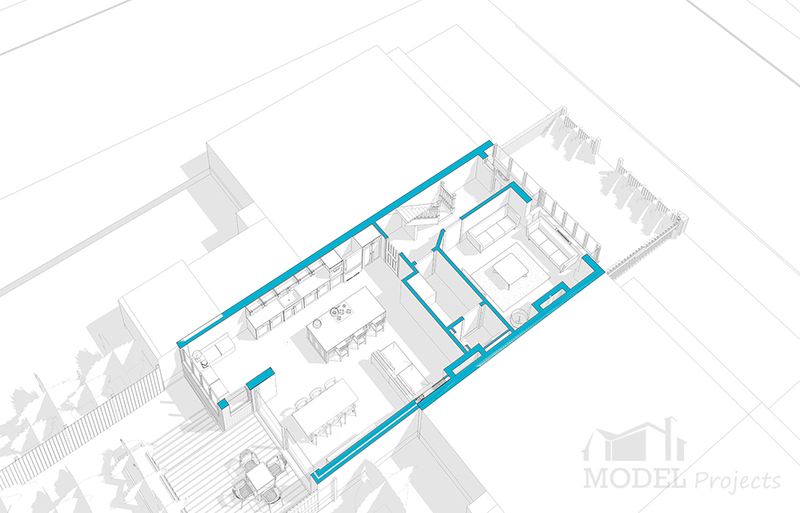 The kitchen layout consists of a line and island that run towards the snug box seating area at the end. The kitchen is a modern shaker style, with a striking teal blue island and gas hob. The run of units are painted white with a simple double butler sink. The use of porcelain timber effect tiles add an element of texture to contrast the simple lines of the kitchen. A wood burner adds warmth to the space, along with feature lighting over the island. Another design feature is the refurbishment of the original period staircase. The introduction of period pattern Victorian tiles also help maintain the original style and character of the property. By utilising the properties Permitted Development Rights, an application for planning was submitted through a Certificate of Lawfulness for both the rear extension and loft conversion with approval being granted. Permission for the ground floor single storey rear extension was gained under Class A - enlargement, improvement or alteration under the properties Permitted Development. Permission for the loft conversion was gained under Class B - the enlargement of a dwellinghouse consisting of an addition or alteration to its roof. Permission for the loft conversion was gained under Class C - other alterations to the roof under Permitted Development. 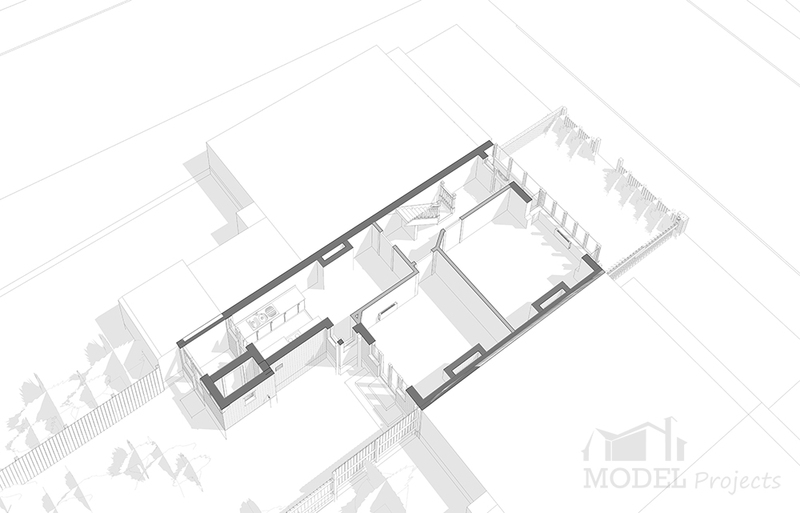 Due to the shape of the existing roof additional volume was not required. We therefore added roof lights and as such only Class C was required. The property was increased in size by 62m2, with the original property being 112m2 and increased to 174m2, with a volume increase from 294m3 to 415m3.